It is critical to connect early with patient-focused organizations, who are built around your needs and dedicated to your precision medicine journey. These organizations will make sure you get what you need for optimized outcomes. If you or someone you love has just been diagnosed with prostate cancer, that’s one of the first questions you will ask. It’s important to get on the right track right away — seeing the right team, having the right tests, and getting the right treatment, right from the start. It is best to consult with specialists who diagnose and treat a high volume of patients with your specific type of cancer. You can find these specialists at National Cancer Institute (NCI)-designated and high-volume cancer centers. Seeking a second opinion at any point is also highly recommended to ensure optimal care for your type of cancer. Download the Prostate Cancer Patient Guide for more information about putting together your team. LEARN MORE. Every case of cancer is different. 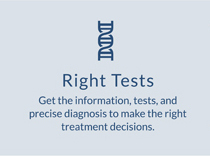 The right tests can help speed you to a specific diagnosis and a more accurate treatment approach. It is important to have genomic testing of your cancer and all other appropriate tests as early as possible to help determine your best treatment options. LEARN MORE. 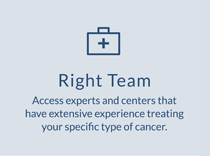 With the right team and right tests, you have what you need to find the best treatment for your specific diagnosis and access the highest quality of care. 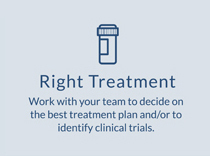 Discuss your treatment goals with your healthcare team, and know all of your options at every stage of your disease. Depending on your diagnosis, a clinical trial may be the best option. LEARN MORE. Raise your hand as a patient and get involved. Share your data throughout your journey. Your specific information and experiences can help you and other patients like you by accelerating research. The more data we collect, the more answers we can provide.